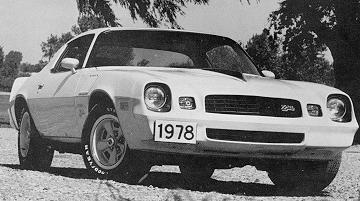 1978 Camaro Production: 36,982 6-cyl, 235,649 V8, 272,631 total. Last six digits increased one with each car built at each plant. Length: 195.5" Height: 49.2" Width: 74.4" Wheelbase: 108.0"
After 4 years of the extruded aluminum bumpers, an all new body color urethane front & rear fascia was finally added to the car. Intended to debut in 1976, production delays held up the restyle until this year. Now hidden behind the sleek new nose was the impact absorbing crash structure able to withstand greater than 5MPH impacts. The rear tail lights were redesigned as well, now incorparating 3-color lenses on either side of the fuel door in the center. The license plate was relocated to a molded in section of the rear bumper. 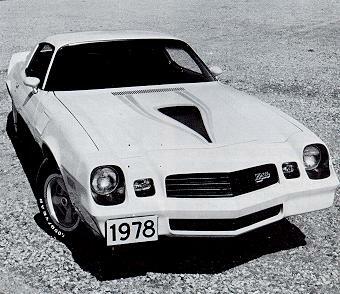 The Camaro wasn't just continuing to blow the competition away on the street, but it paste'ed the rival Mustang in the showroom again, outselling the Ford 247,437 to 179,039. There was no competition. Rally Sport offered as a Camaro Model, not RPO. lower control arm bracing to improve chassis stiffness. Manual transmissions not available in California. * denotes California and high-altitude ratings. Abbreviations: at = automatic transmission, ce = california emission controls, ci = cubic inch, ex = export, mt = manual transmission, uu = uncertain usage. *CHS code typically used for A/T applications. There is documented use of this code with M/T equipped vehicles as well. No manual transmissions available in California for 1978. S = Standard ratio, P = Performance. Note: Buick code located on governor cover. The trim tag, located on the cowl area identifies significant information about your car. Move mouse over code on above trim tag examples for detailed description or Click Here for general trim tag decoding information. Note: Code 34 available on Z28 only. 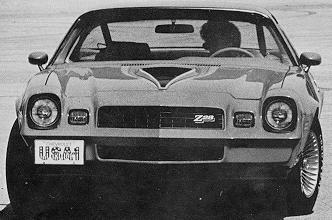 Code 22 & 67 not available on Z28. Levant grain Vinyl. Not available on Rally Sport or Z28. ** With code 11 white seats, 19X had black carpet & instrument panel pad, 24X had blue carpet & instrument panel pad, 44X had green carpet & instrument panel pad, 67X had saffron carpet & instrument panel pad, and 74X had carmine carpet & instrument panel pad. Abbreviations: B = Blue, Bk = Black, C = Carmine, G = Green, T = Tan, W = White, Wb = White seats with blue carpet, Wbk = White seats with black carpet, Wc = White seats with carmine carpet, Wg = White seats with green carpet, Ws = White seats with saffron carpet. V**2 = vinyl Bucket Seats, (N/A Type LT), no charge. 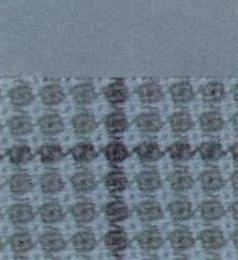 C**2 = Cloth Bucket Seats, (N/A Type LT), $21. Custom Interior: Includes glove compartment light and additional instrument cluster lighting, special insulation, "Type LT" seats, seat trim and door trim. Simulated leather on instrument cluster. Requires D35 sport mirrors. X**2 = Custom vinyl Bucket, (no charge w/ Type LT), $294. 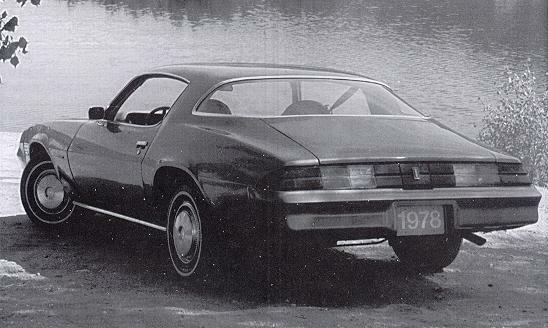 1978 Z21 Style Trim - Includes body colored insert on door handles; bright roof drip, lock pillar, upper fender, hood panel and belt mouldings plus bright accented parking lights. Engine: Hydraulic-cam 350 delivered 185 bhp and 280 ft./lb. torque. Cast-iron crank. 2-bolt mains. Cam timing: 280 degree intake, 288 exhaust, 58-degree overlap, 0.410 inch lift. Rochester 4-barrel carb. No mufflers but after the single catalytic converter the exhaust system split into two resonators and dual tail pipes. Identical to and unchanged from 1977. Transmission: 4-speed Borg-Warner T-10, aluminum case, Inland or Hurst shifter, 2.54:1 low (not available in California). Turbo Hydra-Matic 350 optional, mandatory in California. Front Suspension: Spring rates 365 lb./in. Stabilizer 1.2 inch. Identical to and unchanged from 1977. Rear Suspension: Spring rate 127 lb./in. Rear Stabilizer .55 inch. Identical and unchanged since 1977. Steering: Power assist, straight 13.02:1 overall. Identical to 1977. Wheels & Tires: 15 x 7 rims, Goodyear GR70-15 steel-belted radials standard. 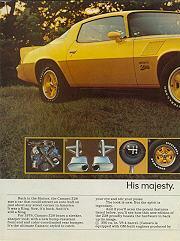 Click here to see the specific 1978 Z28 Chassis Specifications. 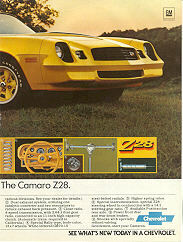 Other Options, equipment, facts: While all Camaros for 1978 were restyled with the new front and rear fascias, the 1978 Z28 engine and suspension was basically identical to 1977. The exception to this was the incorparation of the lower control arm braces and reinforced spring shackles. Headlight bezels and window trim were black anodized, not chrome. New functional "gill" style fender vents, and a non-functional "stinger" style hood scoop which replaced the previously used "hood scoop" decal. Simulated Rope wrapped steering wheel, unique to the Z28. His Majesty. 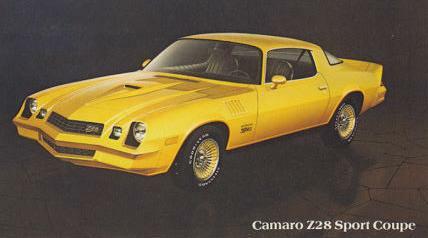 The Camaro Z28. Source: Car & Driver - 3/78. 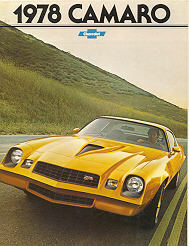 Test Vehicle: 1978 Z28, 4 speed 3.73:1, curb weight 3560 lbs. 1978 Rally Sport Model - Two tone paint scheme, includes "upper color" hood, header panel, grill, headlamp bezels, top of fenders, front part of roof, upper portion of doors, rear end panel and license plate opening. Tri-color decal separates upper color from body color. Tri-color rally sport decals on fenders and deck lid. Option D35 sport mirrors, D80 rear spoiler and ZJ7 Rally Wheels were standard. 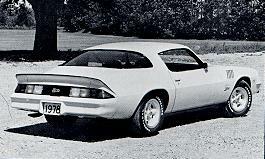 Not available w/vinyl roof, not combinable with Z28 model. Available lower body color choices were: Blue, Camel, Lt. Red, Silver, White & Bright Yellow. 1978 Type LT - Included Custom Interior. 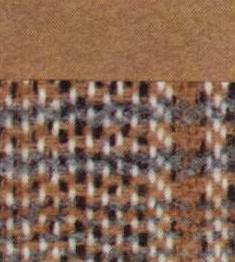 Radcliffe woven sport cloth fabric replaced previous plaid cloth material. Door panels came in two styles with tack on arm rests combined with pull handles, plain panel faces for interiors with cloth seats, and pleated faces for interiors with vinyl seats. Tan simulated leather applique on instrument panel. 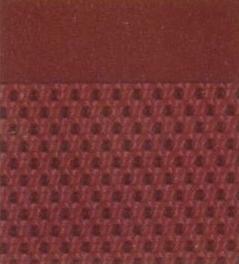 Amberlite insulation blankets included in doors, rear quarters, roof/sail panels, behind rear seat, under package tray and under carpeting (RPO Z54 interior decor/quiet sound). Option D35 sport mirrors, U05 dual horns, U14 Special Instrumentation and ZJ7 Rally Wheels were standard.